Sitting eating Manaeesh, on the terrace of a bullet hole littered building in Geitawi, Beirut, it’s hard to imagine the war of only two decades ago and the even more recent unease in the city. Today this terrace is blooming with flowers, facing shabby, damaged apartment blocks and colourful cathedrals. It’s easy to overlook the scars of civil war that remain here. Despite decades of multifaceted fighting resulting in hundreds of thousands of fatalities and millions of Lebanese seeking refuge elsewhere, I am told there is still some remaining underlying religious tensions… but where in the world isn’t there? Today Beirut feels like a haven of the Middle East, a city where East meets West, where people live in harmony and solidarity despite differences in beliefs. 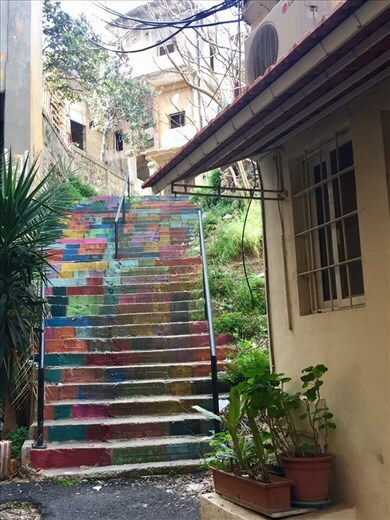 The culture is one of tolerance and acceptance and as a result Beirut’s neighbourhoods have friendly, almost bohemian vibes. A mixture of old, retired couples living a quiet life and young, hipster types chasing their dreams. Where people speak an eclectic mix of Arabic, English, French and Armenian and the streets are lined with never-ending coffee shops, bars and restaurants catering both traditional Arabic style and a more Mediterranean and Western feel. Naturally I started my trip with the usual concerns of a solo traveller, concerns that only briefly cross my mind may I add. Will I feel safe? Will I be hassled? Will I get conned?!! Will I feel intimidated? So on and so forth… After basically no research I decided I would stay in one of Beirut’s only remaining backpacking Hostels in the neighbourhood of Geitawi. Unfortunately, the numbers of visitors to Beirut remain unstable, the conflicts in Syria and the threat of terrorist attacks over recent years have of course played a major role in this. But spending time in Beirut’s neighbourhoods of Gemmyze and Geitawi it’s hard to imagine such a threat exists. I once read that prior to the collapse of tourism in Lebanon that Beirut was fondly labelled the ‘Paris of the Middle East’, its easy for me to see why. The buildings here still hold scars from the civil war. Many bearing hundreds of bullet holes, others just being shells of colonial buildings where fires forced out families and shopkeepers fled seeking a safer life. The walls are stamped with graffiti, ‘urban art’ I heard it called. My favourite thing here is the many steps that have been painted a multitude of colours and patterns, a form of expression from the uprising of the creative culture that is so dominant here. The area serves a small town, bohemian vibe now which is growing in popularity with the cities fashionistas and artists and really offers a glimpse into what the old city had to offer. Scattered with beautiful Ottoman buildings and remnants of the French era, Gemmayze and Geitawi’s backstreets are truly breath-taking. After 5 pm the relaxed Armenia Street comes alive and buzzes with people enjoying after work drinks in the perfect March sunshine. Holes in the wall serve as small shops where party seekers buy drinks to enjoy on the streets. The neighbourhood of Geitawi is calm and eclectic, a place where people wish you a good day without an ulterior motive. Where even weekdays involve long coffee mornings for elderly people chatting in French and exchanging groceries and the younger crowd draw and smoke cigarettes side by side. Beirut is a small city; public transport is lacking and the roads can get hectic. A 30 minute stroll from Geitawi will see you in Downtown Beirut. It’s not hard to know you’ve arrived. The greatest give away would be the city’s main attraction, the Mohammad Al-Amin Mosque with its vivid, shiny blue dome it is truly a beautiful sight. Right next to the mosque stands St Georges Cathedral. A reminder not only of a city with a vast coexistence of cultures and religions but also that of lingering competition and rivalry in a country that was conflicted by sectarian war for so long. From what I’ve learned, Downtown Beirut is one of the oldest cities in the world. Excavations across the city have revealed remains from Roman, Arab, Crusader and Ottoman periods. Ruins are still evident across the city and provide an almost surreal juxtaposition between modern and ancient. During the Lebanese, civil war the site of Beirut souks sustained severe damage from gunfire and pretty much the whole site was demolished. Today an upmarket shopping district stands in its place designed to characterise that of the old traditional souks. It is a place where Beirut’s elite shop designer and sit supping coffee on the heavily military guarded streets. Beiruitis have mixed opinions on the area, some feeling it has little soul or purpose and others revelling in Beirut’s new found flashy personality. I think I always overestimated the size of Beirut. It is a very small city. Good job because the public transport system is distinctly lacking. Buses within the city are mainly non-existent and taxis are expensive. Eventually my feet found me in Hamra. Hamra has a very different vibe and reminds me how individual the neighbourhoods of Beirut are. All little towns of their own. Pre-war Hamra was regarded as the trendiest neighbourhood in Beirut, today it’s hard for me to see why with high street chains and fast food restaurants lining the streets, I could be anywhere in the world. Hamra flourished during the war, it was the sight of Beirut’s first coffee shop, a tradition that lives on today. Post war it lost its sparkle to more upcoming and trendier districts like Gemmyze. The best thing to do in Hamra is get off the beaten high street and explore its winding back alleys filled with pubs and clubs and its up tempo commercial atmosphere. Hamra is a young minded, chaotic neighbourhood with a fun student vibe thanks to the presence of Lebanon’s number 1 university in the area. Just a 30 minute drive out of Beirut is Byblos. Byblos deserves a visit for its beautiful ancient cobbled streets and fishing village atmosphere. They say it is the oldest consistently inhabited city in the world. Once one of the most upscale tourist hubs in the Middle East, Byblos harbour was visited by the likes of Frank Sinatra through the 1970s. Unfortunately, a lot of damage was caused by an oil spill during the 2006 trouble in the area. Today none of the damage is evident and the area is filled with trendy seafood restaurants and open air cafes overlooking fishing boats and private yachts anchored at the stunning ancient port. Sandy beaches and a mountainous backdrop make the area a hotspot for summer tourists but during my time here in Spring there was a mere handful of people walking around enjoying the impressive crusader castle ruins and enjoying shishas and coffee in the lazy atmosphere Byblos is so loved for. A must see if you’re around Beirut. Finally, the last place I must mention is Lebanon’s only real natural landmark. If you walk far enough down the corniche you will stumble across the magnificent Pigeon Rocks. A symbolic landmark of Beirut recently recognised and photographed by Paul Saad and featured by Microsoft, it has been brought into the public eye. Take a walk down this part of the corniche for gorgeous scenery amongst crashing waves, people watching, dog watching, fisherman watching and glass fronted coffee shops overlooking the picture-perfect Pigeon Rocks.